The Cherry Hill community mourns the loss, and celebrates the life, of our longtime Councilman and friend, N. John Amato, who passed away on Thursday following a long and hard-fought battle with cancer. 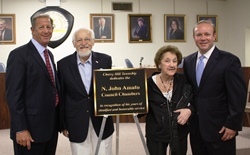 Councilman Amato was the longest-serving Council member in Cherry Hill history, elected to his position in 1983. In the years since, he has mentored and inspired three decades of our community's leaders and truly embodied the best of public service. And if you didn't know John as a Councilman - surely, you knew him as Santa Claus, a role he loved to play for families in our community. It has been a pleasure to serve alongside John, and an even greater honor to call him my friend. He will be forever remembered as a special person whose dedication to Cherry Hill was unparalleled. He will be deeply missed. Read more about John's life and legacy on the Township's website, in the Philadelphia Inquirer, and in the Courier-Post. Residents should note that the start time of the Township Council meeting on Monday, Sept. 22 has been changed. Caucus will now begin at 5:30 p.m. in Room 206 at Town Hall. The general meeting will begin at 6 p.m.
Several members of Council and I joined other local officials and ShopRite Sup ermarkets on Wednesday morning to "Help Bag Hunger" as part of ShopRite's Partners in Caring Day 2014. Councilwoman Susan Shin-Angulo and I spent an hour Wednesday morning helping to bag groceries at the ShopRite on Evesham Road, while Council members Carole Roskoph and Jim Bannar bagged Wednesday afternoon at ShopRite at the Garden State Pavilions. 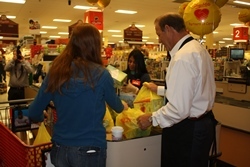 Help Bag Hunger is a way for local stores to raise awareness of ShopRite's Partners in Caring Program, and boost public awareness of the issue of hunger in our communities. Each campaign invites customers to donate money to the Partners in Caring campaign, and all money raised will be used to support the Food Bank of South Jersey. Thank you to ShopRite for once again inviting us to take part in this worthwhile event. It was our pleasure to attend and to help those in need in South Jersey. On Tuesday, my administration and I met with members of my Cherry Hill Business Council to discuss a number of issues of interest to Cherry Hill's business community. The full post-summer agenda included updates on the Township's budget, ongoing economic development projects across town, and a presentation by Kennedy Health System's Lisa Dutterer and Lisa Morina on the proposed revitalization of the hospital's Cherry Hill campus, on Cooper Landing Road. It was, as always, an enlightening and productive meeting, and I look forward to sharing similar information with the Township's Citizens Cabinet in early October. For more information on my Citizens Cabinet or Business Council, please contact Donna Dovey at ddovey@chtownship.com, or call (856) 488-7878. Need a break from homework? Stop by the Gamer's Lounge after school! Take a Just Dance break, play a round of Ping-Pong, try your hand at Giant Jenga, and more! Learn how to lay out your spreadsheet, keep column and row titles on the screen, perform mathematical calculations, sort data, move and copy worksheets, create forms and spreadsheet printing skills. PREREQUISITES: Basic mouse and keyboard skills; Spreadsheet Programs Part I, or equivalent experience. Click here to register. If you enjoy written correspondence and are passionate about keeping the art of letter writing alive, spend time in a relaxed, quiet setting and catch up on your correspondence! Some supplies will be provided, but attendees are encouraged to bring their favorite letter-writing materials. Improve literacy skills and encourage school-readiness with this story time for children ages 3 to 6, featuring stories, songs, finger plays and a craft. Younger siblings must wait with a parent outside the story room. Click here to register. September is National Service Dog Month! Please join us for a screening of "Through a Dog," a documentary about the human-canine bond as told through the moving stories of service dogs and the people whose lives they have changed. This is just a snapshot of the hundreds of events, classes, activities and cultural programs held at the Cherry Hill Library throughout the year. Click here for the full events calendar, and visit www.chplnj.org to sign up for CHPLink, the library’s e-newsletter. Reminder: The Library is closed on Sundays through this weekend. You can renew books, place holds, pay fines and much more 24 hours a day, 7 days a week through the Library website. Stay connected by following the Library on Facebook, Twitter and Pinterest. For more information on any library program, call (856) 667-0300 or email info@chplnj.org. Registration is now open for upcoming Township classes, programs and events. Find a full course listing in the Fall 2014 Community Magazine, which contains a variety of news and photos from Town Hall, as well as information on important events and exciting things to do over the next several months. This season's programming includes something for everyone, with plenty of free and low-cost options available to keep you and your family engaged throughout the fall! For more information or to register for classes online, click here. You can view the full Community Magazine online now by clicking here. If you have not yet received your copy of the Community Magazine, please contact the Recreation Department at (856) 488-7868, or e-mail Recreation@chtownship.com. September is National Preparedness Month, and Cherry Hill Township is joining with the Federal Emergency Management Agency (FEMA) and municipalities across the country to help raise awareness among our residents and ensure that our families, our community, and our local businesses know how to be prepared in the event of a natural disaster or other emergency. From 6-8 p.m. Tuesday, Sept. 30, the Cherry Hill Office of Emergency Management and representatives from the Cherry Hill Police and Fire Departments will take part in America's PrepareAthon 2014, with a special event aimed at teaching residents how to prepare their own emergency kits and providing other valuable information. Stay tuned for additional information on this important event, which will take place in the N. John Amato Council Chambers (Room 208) at Town Hall. In the meantime, visit Ready.gov to learn more about National Preparedness Month and America's PrepareAthon. The Camden County Mosquito Commission is in the midst of its 2014 spraying season, and has treated several areas in Cherry Hill in an effort to reduce the mosquito population. The Commission sprays areas throughout Camden County on an as-needed basis based upon the results of their surveillance efforts. Click here to report a mosquito issue in your neighborhood. The Township posts an updated spraying schedule on our website as it becomes available, along with tips for safeguarding your property against mosquito infestation. The Cherry Hill Fire Department will continue its 2014 Smoke Alarm Campaign this weekend in Cherry Hill Estates and Surrey Place East. Click here for more information. The Cherry Hill community mourns the loss, and celebrates the life, of our longtime Councilman and friend, N. John Amato, who passed away on Thursday following a long and hard-fought battle with cancer. 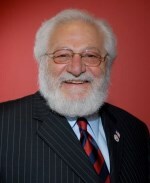 Councilman Amato was the longest-serving Council member in Cherry Hill history, elected to his position in 1983. In the years since, he has mentored and inspired three decades of our community's leaders and truly embodied the best of public service. And if you didn't know John as a Councilman - surely, you knew him as Santa Claus, a role he loved to play for families in our community. It has been a pleasure to serve alongside John, and an even greater honor to call him my friend. He will be forever remembered as a special person whose dedication to Cherry Hill was unparalleled. He will be deeply missed. Read more about John's life and legacy on the Township's website [http://www.cherryhill-nj.com/CivicAlerts.aspx?AID=589] , in the Philadelphia Inquirer [http://articles.philly.com/2014-09-21/news/54139076_1_cherry-hill-mall-council-meetings-council-president-david-fleisher] , and in the Courier-Post [http://www.courierpostonline.com/story/news/local/south-jersey/2014/09/19/cherry-hill-councilman-dies/15877173/] . Several members of Council and I joined other local officials and ShopRite Supermarkets on Wednesday morning to "Help Bag Hunger" as part of ShopRite's Partners in Caring Day 2014. Councilwoman Susan Shin-Angulo and I spent an hour Wednesday morning helping to bag groceries at the ShopRite on Evesham Road, while Council members Carole Roskoph and Jim Bannar bagged Wednesday afternoon at ShopRite at the Garden State Pavilions. Help Bag Hunger is a way for local stores to raise awareness of ShopRite's Partners in Caring Program, and boost public awareness of the issue of hunger in our communities. Each campaign invites customers to donate money to the Partners in Caring campaign, and all money raised will be used to support the Food Bank of South Jersey. Thank you to ShopRite for once again inviting us to take part in this worthwhile event. It was our pleasure to attend and to help those in need in South Jersey. 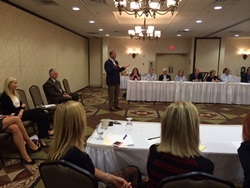 On Tuesday, my administration and I met with members of my Cherry Hill Business Council to discuss a number of issues of interest to Cherry Hill's business community. The full post-summer agenda included updates on the Township's budget, ongoing economic development projects across town, and a presentation by Kennedy Health System's Lisa Dutterer and Lisa Morina on the proposed revitalization of the hospital's Cherry Hill campus, on Cooper Landing Road. It was, as always, an enlightening and productive meeting, and I look forward to sharing similar information with the Township's Citizens Cabinet in early October. For more information on my Citizens Cabinet or Business Council, please contact Donna Dovey at ddovey@chtownship.com [mailto:ddovey@chtownship.com] , or call (856) 488-7878. Learn how to lay out your spreadsheet, keep column and row titles on the screen, perform mathematical calculations, sort data, move and copy worksheets, create forms and spreadsheet printing skills. PREREQUISITES: Basic mouse and keyboard skills; Spreadsheet Programs Part I, or equivalent experience. Click here [http://host6.evanced.info/cherryhill/evanced/eventsignup.asp?ID=5797&rts=&disptype=&ret=eventcalendar.asp&pointer=&returnToSearch=νm=0&ad=&dt=mo&mo=9/1/2014&df=calendar&EventType=ALL&Lib=&AgeGroup=ALL&LangType=0&WindowMode=&noheader=&lad=&pub=1&nopub=&pa] to register. Improve literacy skills and encourage school-readiness with this story time for children ages 3 to 6, featuring stories, songs, finger plays and a craft. Younger siblings must wait with a parent outside the story room. Click here [http://host6.evanced.info/cherryhill/evanced/eventsignup.asp?ID=5754&rts=&disptype=&ret=eventcalendar.asp&pointer=&returnToSearch=νm=0&ad=&dt=mo&mo=9/1/2014&df=calendar&EventType=ALL&Lib=&AgeGroup=ALL&LangType=0&WindowMode=&noheader=&lad=&pub=1&nopub=&pa] to register. This is just a snapshot of the hundreds of events, classes, activities and cultural programs held at the Cherry Hill Library throughout the year. Click here [http://host6.evanced.info/cherryhill/evanced/eventcalendar.asp] for the full events calendar, and visit www.chplnj.org [http://www.chplnj.org/] to sign up for CHPLink, the library’s e-newsletter. Reminder: The Library is closed on Sundays through this weekend. You can renew books, place holds, pay fines and much more 24 hours a day, 7 days a week through the Library website. Stay connected by following the Library on Facebook [https://www.facebook.com/CHPLibrary?ref=search&sid=1520477213.2684015648..1] , Twitter [https://twitter.com/CHPLibrary] and Pinterest [http://www.pinterest.com/chplnj/] . For more information on any library program, call (856) 667-0300 or email [mailto:info@chplnj.org.Mayor] info@chplnj.org [mailto:info@chplnj.org] . Registration is now open for upcoming Township classes, programs and events. Find a full course listing in the Fall 2014 Community Magazine, which contains a variety of news and photos from Town Hall, as well as information on important events and exciting things to do over the next several months. This season's programming includes something for everyone, with plenty of free and low-cost options available to keep you and your family engaged throughout the fall! For more information or to register for classes online, click here [https://reconline.cherryhill-nj.com/] . 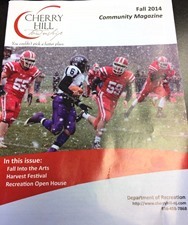 You can view the full Community Magazine online now by clicking here [http://www.cherryhill-nj.com/DocumentCenter/Home/View/1508] . If you have not yet received your copy of the Community Magazine, please contact the Recreation Department at (856) 488-7868, or e-mail Recreation@chtownship.com [mailto:Recreation@chtownship.com] . September is National Preparedness Month, and Cherry Hill Township is joining with the Federal Emergency Management Agency (FEMA) and municipalities across the country to help raise awareness among our residents and ensure that our families, our community, and our local businesses know how to be prepared in the event of a natural disaster or other emergency. From 6-8 p.m. Tuesday, Sept. 30, the Cherry Hill Office of Emergency Management and representatives from the Cherry Hill Police and Fire Departments will take part in America's PrepareAthon 2014 [http://www.community.fema.gov/connect.ti/AmericasPrepareathon] , with a special event aimed at teaching residents how to prepare their own emergency kits and providing other valuable information. Stay tuned for additional information on this important event, which will take place in the N. John Amato Council Chambers (Room 208) at Town Hall. In the meantime, visit Ready.gov [http://www.ready.gov/] to learn more about National Preparedness Month and America's PrepareAthon.